There was a birthday to celebrate this week and I had intended on baking a meringue cake that is family tradition, but time was not on my side. I was forced to do a bit of improvisation. With cocoa powder and hazelnuts on hand I knew that I could whip up a batch of something delicious in less than half an hour, and even if it was a complete disaster we would still be eating gooey chocolate hazelnut batter. There are worse things in life. Since it was a birthday celebration, it only made sense to try to fill the mini chocolate cakes with something. I had vegan chocolate hazelnut spread and rhubarb jam on hand (life lesson #492: always have chocolate hazelnut spread on hand). 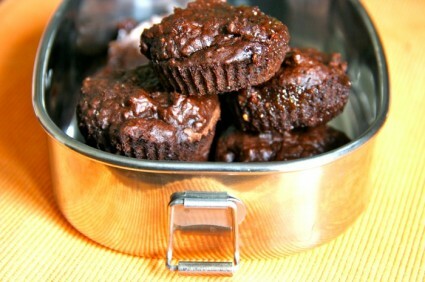 As such, these filled mini chocolate hazelnut cakes (no, I will never ever call them cupcakes) were born. You really could fill them with anything your little heart desires. I started with a basic chocolate cake recipe that I have come to love (it’s in the new Culinary Cyclist cookbook in fact) and used olive oil just to make things interesting; when you’re using enough chocolate powder the olive oil taste doesn’t come across. This recipe makes about 12, and throw the end product in a reusable container and you have a dessert that travels well. Which makes for the perfect addition to a celebratory picnic, train rides or even bike ride fuel.